In part two of a series of articles I will show you how to create your own simple java web service. This article will also be useful for setting up BuildVu (Our PDF to HTML5 converter) with our own BuildVu Web Service. First of all, we need to set up a server to host the web service. I’m using Glassfish 4.0, which allows you to host a local server on your own machine. You can install it yourself and point your IDE in the direction of it’s installation folder. Alternatively, with NetBeans you can download and install Glassfish (amongst others) when you create the project. Select the Java Web category and in the adjacent window select Web Application. Name your project and then press next. Select which server you want to use e.g. GlassFish. If no servers are available click Add and select Glassfish, press next and download the server. You may get a page created called index.html, you can close it as it’s not needed. in your projects window, right click the Source Packages folder, go to New and from the list Select Java Class. You can choose Web Service and it will create a fully generated web service class with some example methods. But for the time being, just create a new Java Class. The layout should be familiar to you as it’s exactly like any other Java class. So how do we turn it into a web service? Add the annotation @WebService above the class, add @WebMethod above the sayHello method and import their classes. And now you’ve declared your java web service. It’s that simple! Right click your project and select “Clean and Build”. The IDE will now launch an instance of Glassfish and put your web service up on it. Now we need to check that Glassfish has successfully deployed the service. To do this, we need to go to the console, which we access via a browser. Navigate to localhost:4848. Once the console is loaded, go to Applications on the sidebar. You should be able to see your java web service listed as an application. Click on the name of the web service to open the Edit Application. On the table at the bottom find the action called “View Endpoint”. From there, we go to a page with a couple of links. The first link takes you to the previous page. The second link offers a tester utility which allows us to test the web service without the need of creating a client application, it also allows us to view the raw SOAP XML. 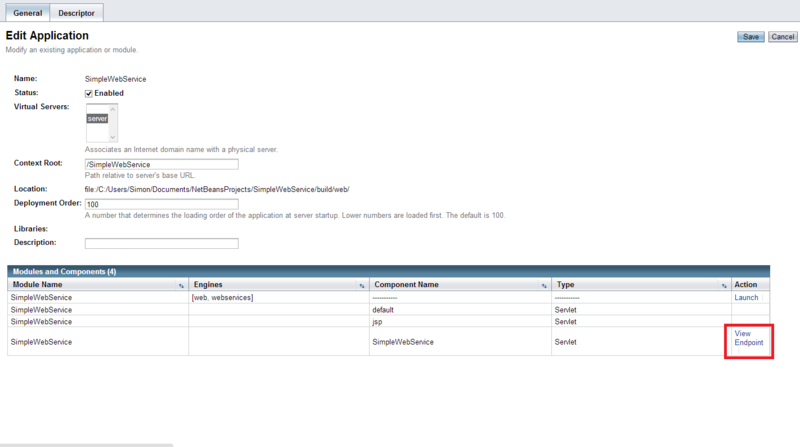 The third one allows us to look at the actual WSDL generated for the web service. Type something into the text box and press the “sayHello” button. We can now view the SOAP request and response generated. You may have noticed that the elements in the SOAP body are generic with “sayHello” and “arg0” tags. 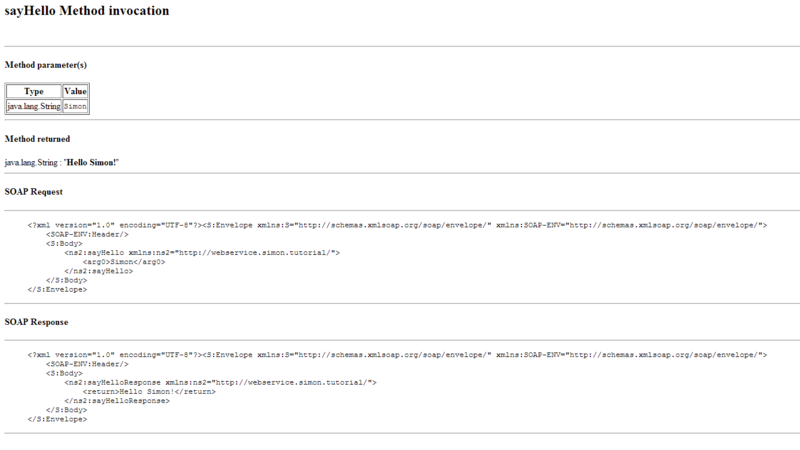 to make these look nicer, we need to add some parameters to our annotations in the java web service class. In this article I’ve covered how to create a small web service and how to do some simple testing from within Glassfish. I would like to note that putting business logic inside of your Web Service isn’t a very good practice. Instead have a class which handles interaction from the web service interface and your business classes. I also encourage you to play around with this web service and add methods of your own. Try looking at what happens when you use Lists as parameters and return values. Also try implementing your own client, using my previous tutorial if you need any guidance. Got any questions or comments? Feel free to post them below. First of all, we need to set up a server to host the web service. Need not be the case! This is a misconception. You can use the Jetty server embedded with Java itself. For example add the following main method to the SimpleWebService.java file and execute. Thats all. Server runs at 127.0.0.1 with port 9009. wsdl is available at http://127.0.0.1:9009/SimpleWebService?wsdl. Thanks for pointing out Jetty to me, I admittedly haven’t played with Application Servers much outside of Glassfish/JBoss. Do you know how to use the Tester utility once the web service has been secured? Unfortunately it seems like Glassfish doesn’t support using the tester facility with a secured web service. I have to use this service on android . 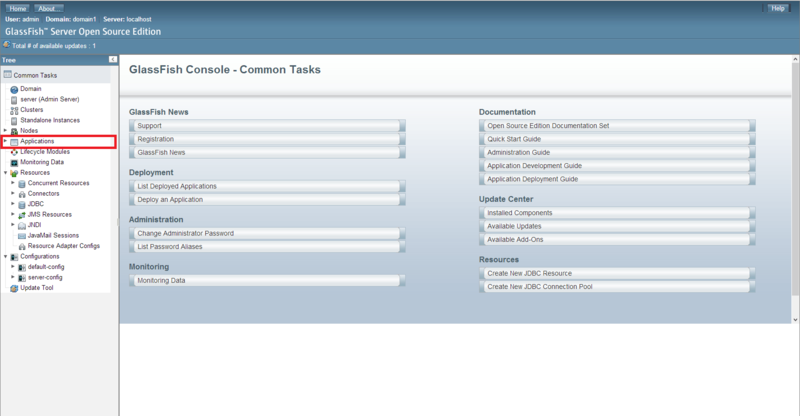 I have completed every step.I opened glassfish interface on browser and opened my application. After that I clicked “view endpoint” and started test page. But I am getting error. Error title is HTTP Status 500 – Internal Server Error. Error description is The server encountered an internal error that prevented it from fulfilling this request. Could you help me ? is your application deployed and running (please try to view index.jsp or index.xhtml file) ? if it is running without any issues then check whether you can view the wsdl file from glassfish server interface ? I deployed my application in Glassfish 3.1.2 and able to see the end point url and wsdl working fine during my initial tests from soap ui. Today the same war file deployed into Glassfish 4 and unable to see the View End point url, does any one faced same problem and what will be the solution for this? Adding more information, java version: jdk1.7.0_79 and JRE7, Glassfish 4 and windows 2012 server. How to add another service to already hosted web service without server down.